What does BP stand for? What does BP mean? This page is about the various possible meanings of the acronym, abbreviation, shorthand or slang term: BP. BP plc (formerly The British Petroleum Company plc, British Petroleum and BP Amoco plc) is a British multinational oil and gas company headquartered in London, England. It is one of the world's seven oil and gas "supermajors", whose performance in 2012 made it the world's sixth-largest oil and gas company, the sixth-largest energy company by market capitalization and the company with the world's 12th-largest revenue (turnover). It is a vertically integrated company operating in all areas of the oil and gas industry, including exploration and production, refining, distribution and marketing, petrochemicals, power generation and trading. It also has renewable energy interests in biofuels and wind power. As of 31 December 2017, BP had operations in 70 countries worldwide, produced around 3.6 million barrels per day (570,000 m3/d) of oil equivalent, and had total proved reserves of 18.441 billion barrels (2.9319×109 m3) of oil equivalent. The company has around 18,300 service stations worldwide. Its largest division is BP America in the United States. In Russia, BP owns a 19.75% stake in Rosneft, the world's largest publicly traded oil and gas company by hydrocarbon reserves and production. BP has a primary listing on the London Stock Exchange and is a constituent of the FTSE 100 Index. It has secondary listings on the Frankfurt Stock Exchange and the New York Stock Exchange. BP's origins date back to the founding of the Anglo-Persian Oil Company in 1908, established as a subsidiary of Burmah Oil Company to exploit oil discoveries in Iran. In 1935, it became the Anglo-Iranian Oil Company and in 1954 British Petroleum. In 1959, the company expanded beyond the Middle East to Alaska and it was one of the first companies to strike oil in the North Sea. British Petroleum acquired majority control of Standard Oil of Ohio in 1978. Formerly majority state-owned, the British government privatised the company in stages between 1979 and 1987. British Petroleum merged with Amoco in 1998, becoming BP Amoco plc, and acquired ARCO and Burmah Castrol in 2000, becoming BP plc in 2001. From 2003 to 2013, BP was a partner in the TNK-BP joint venture in Russia. BP has been directly involved in several major environmental and safety incidents. Among them were the 2005 Texas City Refinery explosion, which caused the death of 15 workers and resulted in a record-setting OSHA fine; Britain's largest oil spill, the wreck of Torrey Canyon in 1967; and the 2006 Prudhoe Bay oil spill, the largest oil spill on Alaska's North Slope, which resulted in a US$25 million civil penalty, the largest per-barrel penalty at that time for an oil spill.The 2010 Deepwater Horizon oil spill, the largest accidental release of oil into marine waters in history, resulted in severe environmental, health and economic consequences, and serious legal and public relations repercussions for BP. 1.8 million US gallons (43,000 bbl; 6,800 m3) of Corexit oil dispersant were used in the cleanup response, becoming the largest application of such chemicals in US history. The company pleaded guilty to 11 counts of felony manslaughter, two misdemeanors, one felony count of lying to Congress, and agreed to pay more than $4.5 billion in fines and penalties, the largest criminal resolution in US history. On 2 July 2015, BP and five states announced an $18.7 billion settlement to be used for Clean Water Act penalties and various claims. Couldn't find the full form or full meaning of BP? 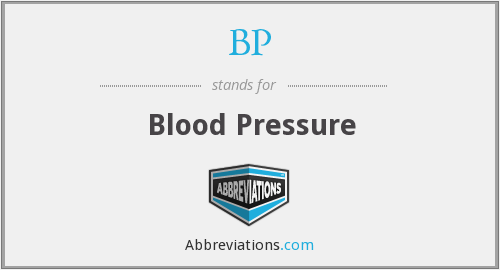 Know what is BP? Got another good explanation for BP? Don't keep it to yourself! "BP." Abbreviations.com. STANDS4 LLC, 2019. Web. 18 Apr. 2019. <https://www.abbreviations.com/BP>.